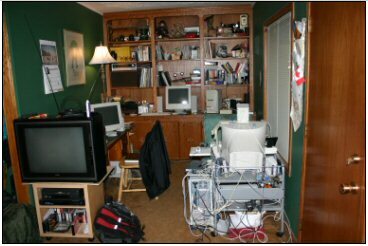 Well, it's been over a year since I posted a pic of the Oasis Labs, and a lot has changed since then. I've moved twice, upgraded a lot of the equipment, and generally improved the working conditions here at Oasis Central. So, not that anyone probably really cares, I'm gonna give y'all an update and some new pics. The whole thing is set up in a cozy nook off the front room/living room. The computer to your right is the main workhorse around here, we'll call her "Whining Wendy The Windows Box." Notice that the TV is strategically pointed AWAY from the work area. I used to have it on a rotating Lazy Susan, so I could turn it to face me while I'm sitting at the computer, but that didn't exactly improve productivity, so out went the Lazy Susan. At the back are the bookshelves, which aside from being stuffed with various typical bric-a-brac, also contain various computer and Linux manuals, and a random assortment of spare parts and cables. It also houses "Glamorous Glenda, the Graphics Box." You can't see from this picture, but I customized the cupboard underneath it, so that you can open the doors and slide out a keyboard/mouse shelf, that's at a perfect working height. This is actually the wife's machine. She's the only graphic artist I know who was trained on, and has spent her entire career on, a Windows machine. Go figure. And oh! Don't blame her for the graphics on the site, those are mostly my fault, aside from the jazzied up new drifter-guy logo. On the left is "Lovely Linda the Linux Box." More about her later. I have more crap and peripherals hooked up to Wendy than I care to list. Most of which has to do with things I do for a living (which sure has nothing to do with the Oasis). If you look closely at the back of tthe case, you might notice a red tinge. This has to do with a rebuild of the cooling system I recently completed. The old cooling system was noisy and inadequate, especially if you're into doing dumb things like overclocking your processor. The new cooling system is amazingly efficient, extremely quiet, and causes the computer to emit a multi-colored glow that's especially funky at night with the lights off. I give Whining Wendy more grief than she rightly deserves. The truth is, the case and the motherboard are stock, and other than that, I've messed with and modded the internals pretty heavily. She's a pretty hot pIV machine when it gets right down to it. Her main fault in life is that she runs on Windows XP, which is, at the moment, a neccessary evil. 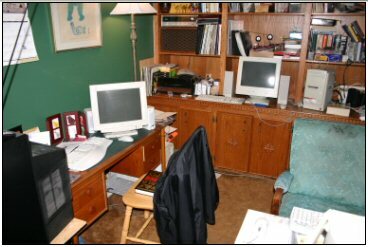 The two simplest, and best things, I did to improve my working life were to put that big comfy rocking chair on casters, and to cover the mousepad extension of the desk with paper. I wrap and tape a sheet of paper over the mouse tray, and use it to scribble down important notes, like color hexcodes, phone numbers, and how much change I'm gonna have to dig out of the sofa to pay the pizza guy. When this gets filled, I just layer a new piece of paper overtop of it. Every month or so, I get out the constuction knife, and carve the accumulated layers loose, then stack them with other piles of old layers. One of these days, I'm gonna make a collage out of it and sell it at a modern art fair. Glenda, as I mentioned, is the wife's machine. I have very little to do with it, and like it that way. Unlike like 99% of the graphic artists I've encountered over the years, my wife seems perfectly capable of not screwing up her computer. She's a rare one, that girl. Lovely Linda the Linux Box, on the other hand is just plain fun and joy. Basically, it's an old pII that's had every last trace of M$ eradicated from its hard drive. After wrestling with a couple of different "legit" distributions of Linux, I finally ended up installing a completely hacked version of Knoppix on it. Yah, I know. Knoppix is supposed to be a "Live Evaluation" Linux that you run from a CD. It's own creators say that if you try and install it as your native OS on the hard drive, it risks becoming flaky and "dangerously unstable." Not surprisingly, given that it's still Linux, there are plenty of hacks available to do just what the original coder tells you not to do. And man, it runs unbelievably sweet for such an outdated machine. It's simply a joy to play around on. Mind, I have the processor overclocked beyond anything sane for a pII class processor, but still, it way outperforms anything you could possibly imagine Windows doing on a similarly equiped/over-revved machine. Eventually, provided the processor doesn't melt into a puddle at the bottom of the case as a result of the overclocking, I'm going to turn it into a server to host the Oasis and a couple of other domains I have on the go. With properly managed Apache Server software onboard, it should be able to more than handle a few relatively light traffic domains. For now, other than being useful for compatibility testing the Oasis and a couple other domains I work on, I'm using it as the house "Internet Kiosk." When friends and relatives come over to visit, they always end up wandering into the computer corner to do some surfing. I have the two windows machines basically in lockdown mode, so only the wife and I can use them. But I have a "Web Kiosk" account set up on Linda, so that no matter how dumb you are, you're not going to infect my machines with spyware, crapware, viruses, and all the other cludge that people seem to accumulate on their computers. It's Linux. It's mostly immune to all that. And because it's linux, once people get out of the browser, they're essentially locked out from accessing anything else on the computer. 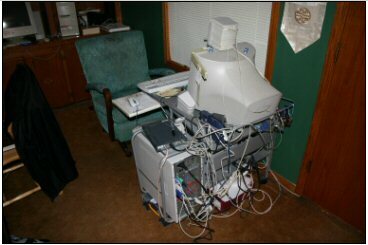 I've wasted enough time over the years cleaning up my computer after someone else has sat down at it "just to check their e-mail." Well, that's about it for now. Mostly thoroughly non-fascinating stuff, but now, if anyone asks what it's like here at Oasis Central Laboratories, (not that anyone does), I can just point them to this URL.